Ladies, want to know how to make your skin irresistibly radiant and healthy? Try this DIY treatment, which uses ingredients many of you probably already have in your cupboard! I stumbled upon this beauty secret years ago and it’s quickly becoming one of the most popular home-made body scrubs because it’s easy, good for your skin, low maintenance and cheap! Brown sugar– when you think of it you may imagine cookies + candy, but it also contains ingredients that can be greatly beneficial to your body’s largest organ, your skin. Yes, I’m talking about using brown sugar as an all over body exfoliant. 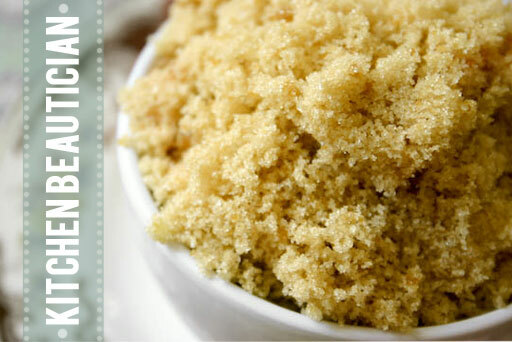 Brown sugar’s granulated particles exfoliate and clear away dry, dead skin cells. This creates a noticeably smoother, more youthful glow to your skin, which is an effect almost all women desire to maintain. Brown sugar is an anti-bacterial and also contains glycolic acid which is an alpha-hydroxyl acid ingredient that keeps skin healthy + vibrant. At the same time it moisturizes and conditions the skin and protects it from the harmful effects of toxins. Lastly it smells delicious! Using brown sugar as a relaxing aromatherapy at home spa treatment will most definitely leave you feeling like a domestic goddess. It’s good to mix it with natural olive oil so it adds extra moisture and creates a sticky consistency that’s easier to apply. Remember you can use it as an all over body scrub and even use it on your face every other day for a radiant glow, but be gentle! The skin on your face is much more sensitive. a few drops of water. And voila! It’s that easy. For a perfectly delicious home made skin care treatment brown sugar will make you look and feel glorious and everyone around you will be amazed at the condition of your soft and glowing beautiful skin.